Today, Total Network Inventory takes another step forward. Version 4.1 gives you the opportunity to obtain maximum information on Windows updates. Neither did we stop refining and updating the already familiar functionality. The full rundown is available below. From the Windows Update log. Just rescan any Windows computer and gain access to new information in the reports. You’ll find complete information about the update installation operations and their results on the scanned system. From the Windows Update service. Unlike the previous method, this option provides information not only about already installed updates, but also those that can be installed on the scanned system (exactly as it appears on the Windows Update page). By default, this method is disabled, since its scans can take a long time. If this doesn’t bother you, you can activate it in the program settings. You can make use of both these methods to have better control of the updates status on Windows-based computers in your network. 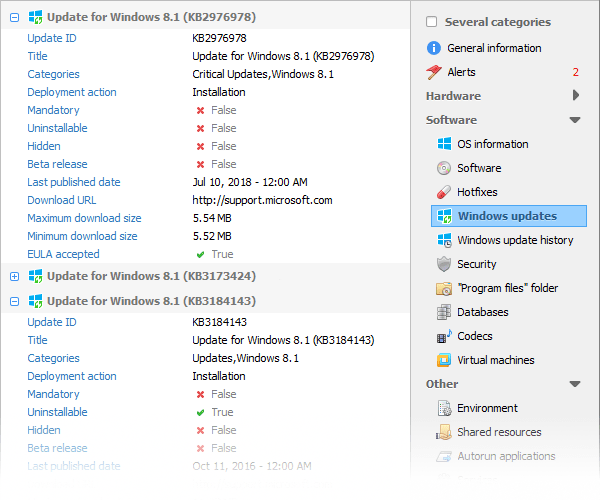 NewCollecting information about Windows updates. NewCollecting information from Windows update log. NewReport templates for Windows updates. NewCollecting MS Office 2019 license keys. NewNew icon in the “Operating system” assistant: for Windows Server 2019. NewNetwork map autosaved by timer, plus a Manual Save button. NewReporting the last login time and username on Windows. New“Creation date” field for all assets. NewTracking of serial numbers of USB devices in the Change log. NewTracking of anti-spyware version in the Change log. NewTracking of all parameters of memory modules in Change log. NewIf the scanned device lacks both the network name and IP, a corresponding entry will be added to the scanner log. ImprovedVarious improvements and tweaks in the network map. ImprovedScanning and tracking software installed only for individual users. ImprovedOptimized mechanism for updating MIB files. FixedImporting folders into the storage using drag and drop onto the network tree and using the context menu. FixedError message when scanning Active Directory using incorrect credentials. FixedObtaining multiline fields from Active Directory. FixedDetermining the status of antivirus and antispyware software on some server platforms. FixedExporting fields with dates and multiline fields into XLSX. FixedDuplication of filters in Software accounting. FixedIncorrect display of information in the “RAM total capacity and modules” field in printable reports. FixedDisplay of TNI’s OS X agent version. FixedRefresh mechanism for printable reports. FixedSearching in the network tree. Additionally, we want to bring your attention to our poll that’s still being held in the next post. Please vote if you haven’t already done so. That’s all the news for the day. Later!